1. On a lined baking sheet, unfold puff pastry dough. 2. In a large bowl, combine shredded chicken, hot sauce, and creamed cheese. 3. Spread cream cheese mixture on the entire top of the puff pastry dough. 4. 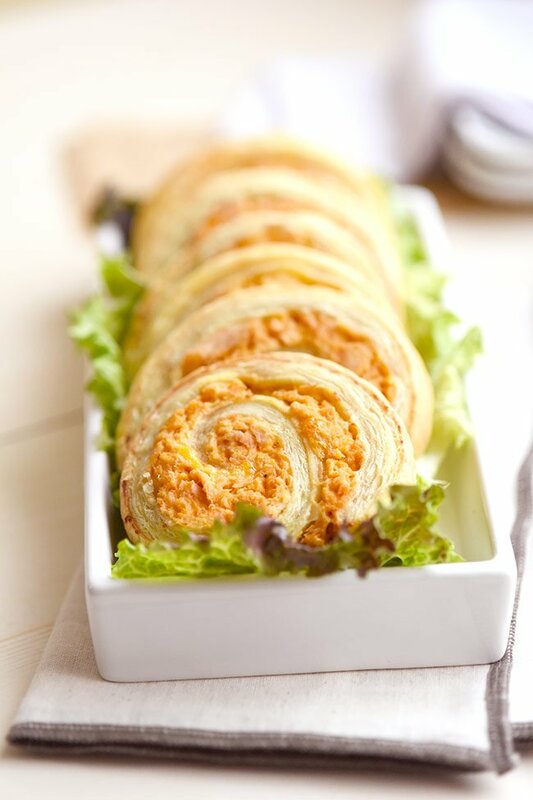 Tightly roll up the puff pastry and buffalo chicken mixture to form a log. Place log seam-side down on a cutting board and cut into 3/4" slices using a bread knife. 5. Place slices on your lined baking sheet. Bake at 400˚for 15 minute of until puff pastry is golden brown and looks crusty. 6. Serve hot drizzled with ranch dressing or with a side of ranch to dip. 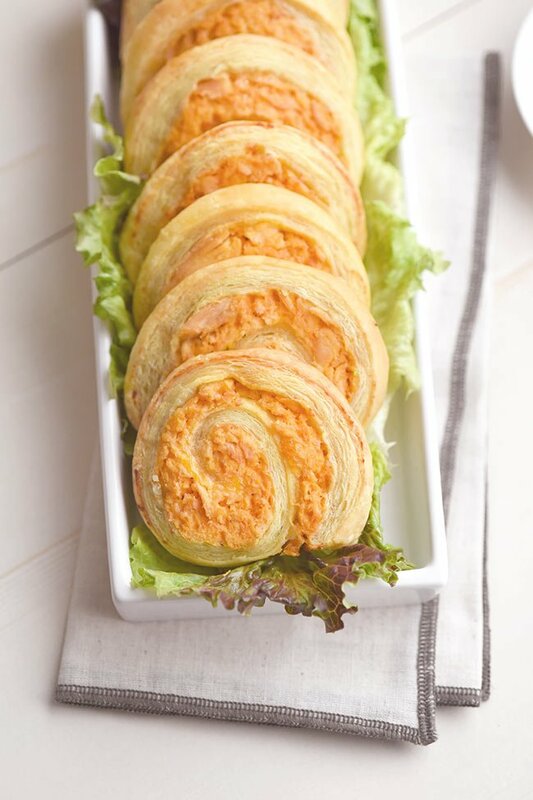 These buffalo chicken pinwheels made with puff pastry make a delicious game day or party appetizer. Or make them just for you and the fam or friends for an at-home Friday movie night snack. They’ve got buffalo chicken wing flavor you know and love all wrapped up and baked in puffy pastry dough. 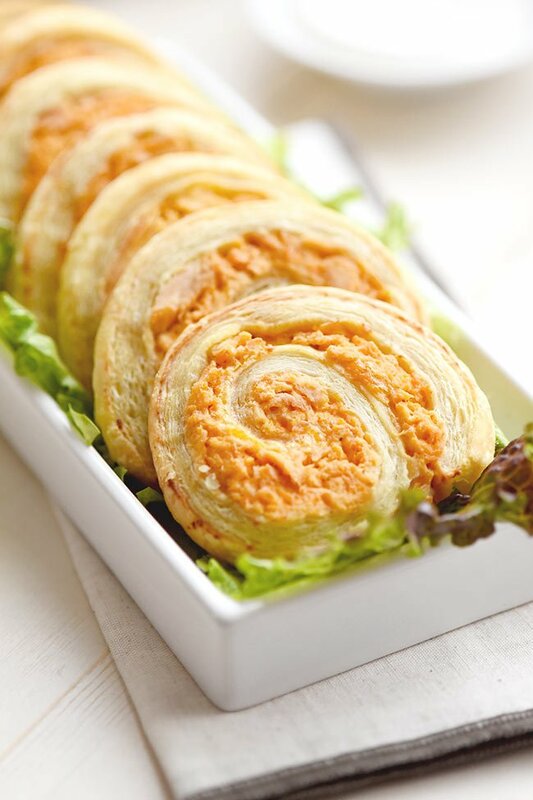 Thee buffalo chicken pinwheels are super easy to make. You can roast chicken on a baking sheet and then shred or you can just grab a ready-to-go rotisserie chicken and start there to save time. My favorite shortcut to shredding chicken is to use a mixer! It works so well and so much faster than shredding by hand. Just put cooked chunks of chicken in a large bowl and use you mixer on low to shred the chicken. You may need to lift it up and press into the bigger chunks to get everything start. What’s the best hot sauce for buffalo wing flavor? Frank’s is my personal favorite hot sauce. It’s a classic for a reason. You’re going to get that authentic buffalo chicken wing flavor when you use Franks. However, if you’re a fan of a different type of hot sauce or you just want to broaden your horizons, try a different brand! There is no right or wrong hot sauce, so have some fun taste testing and then choose one that you like best for this recipe. 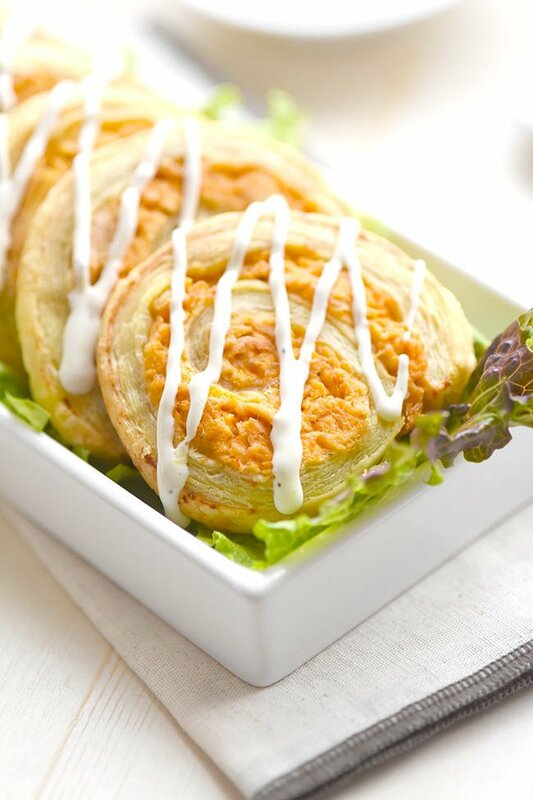 Tips for successfully cooking these buffalo chicken pinwheels using puff pastry. The other thing is, you’ll want to start with room temperature buffalo chicken mixture. So, if you made your filling the night before like I did, then you’ll want to microwave the filling just enough to get it room temperature again of slightly warmer. So, 1 minute, stir, and another minute or two should get you there. This makes sure the middle of the pinwheel cooks evenly. Now, if you’re super picky, you would want to chill the pinwheels after you roll them to get the dough and the fill all the same temperature before baking them. They’ll be much easier to cut chilled, or everything will cook evenly. If you don’t have time for that, it’s okay. They won’t look exactly perfect but they’ll still taste amazing. Last little tip is for the shredded cheese. You only need a little bit! So for that reason I use the Mr.’s microplane to freshly grate a small block of cheesy over top of the buffalo chicken mixture right before it gets rolled up. He swears by that things and I’ve come aroudn to liking it a lot too. The cheese is very finely grated and it’s soft. Also, pre-shredded cheese has a powder coating to keep it from sticking together. And once you know about that, you can’t help but taste talcy powder every time you use it form then on. Sorry. But really, buying a block of cheese lasts a lot longer too and you can grate just a little bit every time you need it. Or use a food processor to grate a bunch if your recipe calls for a lot like my loaded potato soup! If you make sure to do these things, you’ll be in really good shape. The rest is easy peasy. Do you love all things buffalo chicken as much as I do? 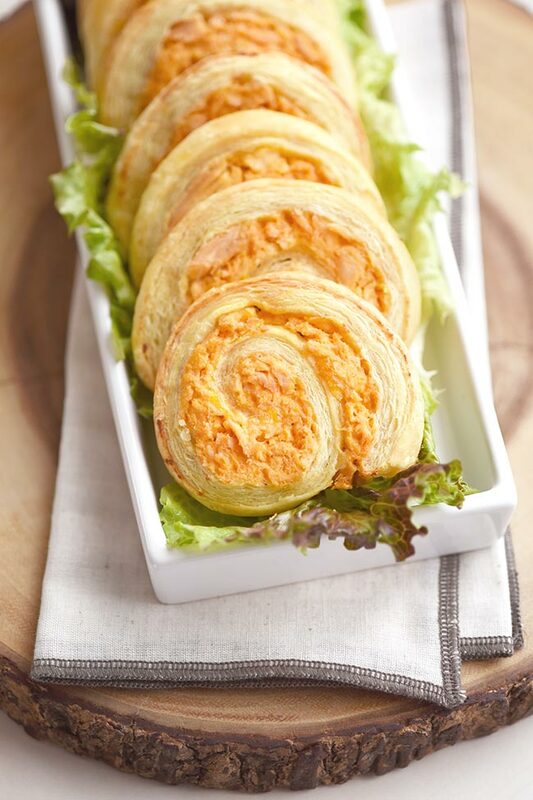 This recipe for Buffalo Chicken Puff Pastry Pinwheels was featured on Menu Plan Monday and South Your Mouth!